Having come across a comment a while back that ‘old punks don’t die; they just turn to country’, it’s always interesting to relate Laura Cantrell with the championing she received a decade or so ago from the late John Peel. Amongst all the introspective dark indie guitar bands that followed the beacon of the late iconic DJ, the sessions the velvet voiced Laura recorded for him must have been like diamonds in a rich seam of gritty urban matter. 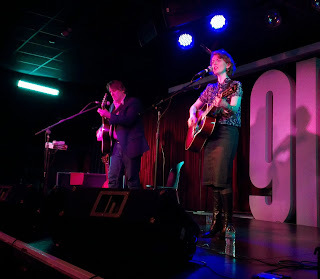 The UK has been good to Laura over the years and this solid base of support has been rewarded with a full visit this year with one of the stopping off points being a well-attended evening in the main room of Birmingham’s Glee Club. With the exceptional guitar maestro, Mark Spencer, perfectly settled in as Laura’s on-stage side kick, the audience, containing plenty of devoted admirers, was not left disappointed instead many members were drooling over a 90 minute set of exquisite and magical pure country music. 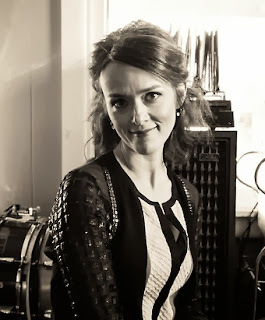 The new album being promoted by Laura, her first of original material since 2005, understandably featured prominently during the evening and the new material neatly dovetailed some Laura Cantrell classics and a couple of covers dear to her heart. Laura definitely doesn’t hide her adulation for Kitty Wells and it was not surprising to hear her special tribute to one of the ground breaking trailblazers for female country music. ‘Kitty Wells Dresses’ was also the title of her 2011 release and whilst apologising for not fully touring the UK with the album, Laura further set the record straight with a version of ‘Making Believe’ and poignantly stating that Kitty passed away on Laura’s birthday to cement the devoted link. The handful of songs previewed from the new album NO WAY THERE FROM HERE suggest another batch of growers that will settle and flourish amongst Laura’s impressive back catalogue. However the truly golden moments of the main set were a trio of old favourites which started early in the performance with ‘Queen of the Coast’ before climaxing with ‘When the Roses Bloom Again’ and the seminal ‘Not the Trembln’ Kind’. By then Mark’s versatile guitar and Dobro playing had lit up Laura’s songs and the rich, soft, smooth trademark vocals which set her apart from many other artists sounded as good as ever. The not so secret success of many live shows is to save the best ‘til last and Laura surpassed anything in the main set with a stunning encore of four songs that went as far as you could go to gather evidence of her ability to tunnel straight to the heart of country music. Mark and Laura re-vitalised the Cowboy Jack Clement standard ‘Just Someone I Used to Know’ made famous by Dolly and Porter and sent the crowd home humming to the rhythmic ‘Yonder Comes a Freight Train’. In between a captivating performance of ‘Two Seconds’ and the honky tonk rousing ‘ The Whiskey Makes You Sweeter’ had met the audience’s full approval, although with a polite declining to holler to the latter. The new album and the accompanying UK dates have reminded a lot of people of what Laura Cantrell is all about and this Birmingham return was a resounding success for all parties. All we need now is for Laura to shorten the wait for her next appearance in the area.